The industry’s venture into reduced-lignin alfalfa is still in the early stages, but initial results point to some positive benefits for both alfalfa and dairy producers. The high nutritive value of alfalfa makes it a valuable forage for ruminant animals. However, alfalfa producers are continually faced with balancing yield and quality during the growing season. Research and on-farm experience has shown that just a few days delay in alfalfa harvest boosts neutral detergent fiber (NDF) concentration, which leads to reduced animal intake. In addition, the fiber is less digestible because of higher lignin content in the plant cell walls. A number of years ago, a group of scientists set out to solve this problem. That consortium for alfalfa improvement included scientists from Forage Genetics International, the USDA Dairy Forage Research Center, and the Noble Research Institute. Their work resulted in reduced-lignin alfalfa that was commercially released in 2015. This reduced-lignin alfalfa technology is marketed as HarvXtra. HarvXtra is a genetically modified alfalfa trait developed through a technique that suppresses the activity of a lignin pathway enzyme resulting in less total plant lignin. The suppressed pathway enzyme is responsible for producing a type of lignin that is highly branched; high-branching lignin limits fiber digestibility. The suppression or down-regulation of this pathway enzyme reduces the synthesis of the high-branching type lignin to help improve fiber digestibility, resulting in higher quality alfalfa. With the release of HarvXtra alfalfa, many alfalfa producers across the country are becoming interested in its performance. In spring 2015, we established a research study to evaluate HarvXtra against two nonreduced-lignin alfalfa varieties (54R02 — selected for yield and WL 355RR — selected for higher quality). The trial was conducted in six states: California, Kansas, Michigan, Ohio, Pennsylvania, and Wisconsin. The main objective of this research was to evaluate reduced-lignin alfalfa versus nonreduced-lignin alfalfa subjected to three harvest schedules (28-, 33-, and 38-day intervals) at each location. Yield and forage nutritive values were determined at every cutting in both 2015 and 2016. Forage quality was determined using near-infrared reflectance spectroscopy (NIRS). The NIRS was calibrated using samples from the entire six state data set for estimating crude protein (CP), NDF, and neutral detergent fiber digestibility (NDFD). HarvXtra always had greater NDFD than the nonreduced-lignin varieties when averaged across all locations and cuttings in both years (Figure 1, 2016 data). 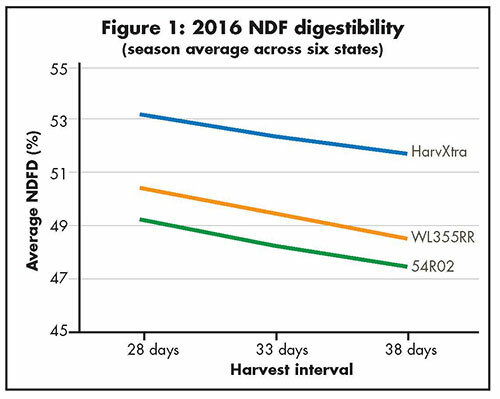 The differences in NDFD across harvest schedules ranged from 5 percent to 9 percent (2.7 to 4.2 percentage units of NDFD greater for HarvXtra). In Figure 1, we can also see that HarvXtra alfalfa harvested on 38-day intervals had higher NDFD than the two other varieties harvested 10 days earlier, when averaged across all locations and cuttings. In some cuttings, the NDFD of HarvXtra at 38 days was similar to the NDFD of the other varieties at 28 days, but it was never significantly lower. The NDF for HarvXtra was similar to that of WL 355RR but was always about 7 percent lower (2.5 units of NDF percent) than that of 54R02. Crude protein differences between all the varieties were minimal and nonsignificant. We also found that HarvXtra consistently matured more slowly than the nonreduced-lignin alfalfa cultivars. Overall, variety differences in forage quality were quite consistent across all cuttings. The HarvXtra variety we tested demonstrated that it was consistently superior in forage quality throughout the growing season. However, yield is also a primary consideration for alfalfa producers. 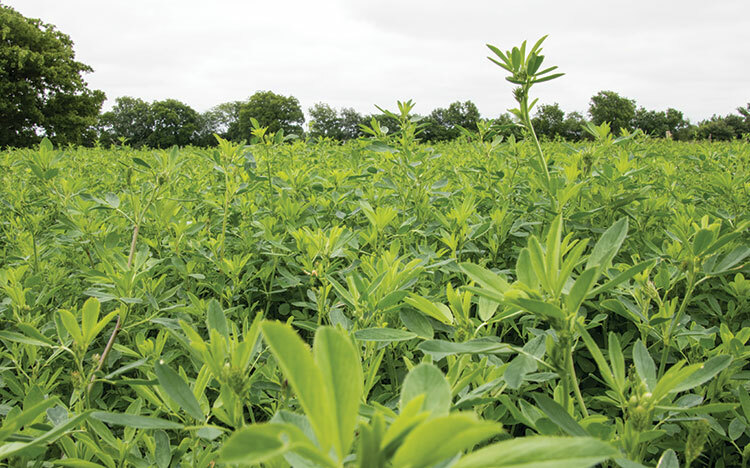 The total annual yield for the HarvXtra variety was about 7 percent less than the nonreduced-lignin alfalfa varieties for the average across all locations. One should remember that this was just one cultivar comparison, and other studies have shown no yield drag due to the reduced-lignin trait. We were more interested in comparing the yield of HarvXtra harvested on longer harvest schedules with the nonreduced-lignin varieties harvested at shorter harvest schedules. 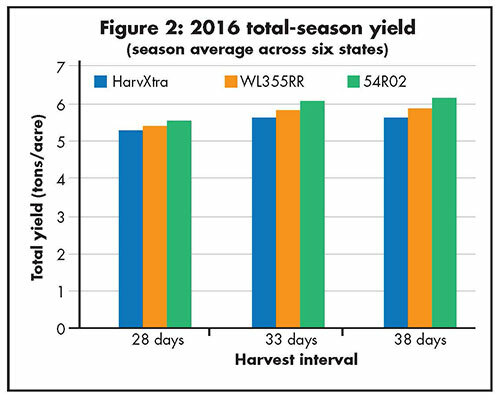 The yield of HarvXtra harvested on the 33-day harvest interval was similar to the yield of the nonreduced-lignin varieties harvested on 28-day intervals (Figure 2). Likewise, the yield of HarvXtra harvested on the 38-day schedule was similar to the yield of the nonreduced-lignin varieties harvested on the 33-day schedules (Figure 2). The results from this study demonstrated that if HarvXtra is harvested later, it would yield similarly and have the same quality as nonreduced-lignin cultivars harvested earlier. Looking forward, what does this mean for alfalfa producers? Alfalfa producers are offered more flexibility when making harvest management decisions. Growers can harvest HarvXtra five to 10 days later and maintain adequate nutritive value and similar yield to nonreduced-lignin cultivars harvested five to 10 days earlier. This flexibility in harvest would be particularly helpful to growers when alfalfa harvest is delayed because of weather conditions or other farm needs that may require immediate attention. Our results also show if HarvXtra is maintained on the same cutting schedule, growers could get higher quality alfalfa. The HarvXtra variety we tested was one of the first commercially released reduced-lignin alfalfa varieties. Since then, additional reduced-lignin varieties have been released commercially. As genetic improvement continues in the development of new reduced-lignin alfalfa varieties, yield will likely continue to be improved. This technology promises to be a tremendous tool for alfalfa producers striving to harvest high-quality alfalfa on a consistent basis. The author wishes to acknowledge the other researchers involved in this project: R. Mark Sulc (The Ohio State University), Kenneth Albrecht and Dan Undersander (University of Wisconsin), Kim Cassida (Michigan State University), Marvin Hall (Pennsylvania State University), Doo-Hong Min and Xuan Xu (Kansas State University), Steve Orloff (University of California-Davis), and Edzard van Santen (University of Florida).